California's Driest Region Finds Short-Term Drought Aid Progress is being made toward bringing water to thousands of Central Valley residents in underserved communities where wells have run dry. The question is how long this solution will last. Five 2,500-gallon water tanks wait to be unloaded at the nonprofit Self-Help Enterprises near Visalia, Calif. 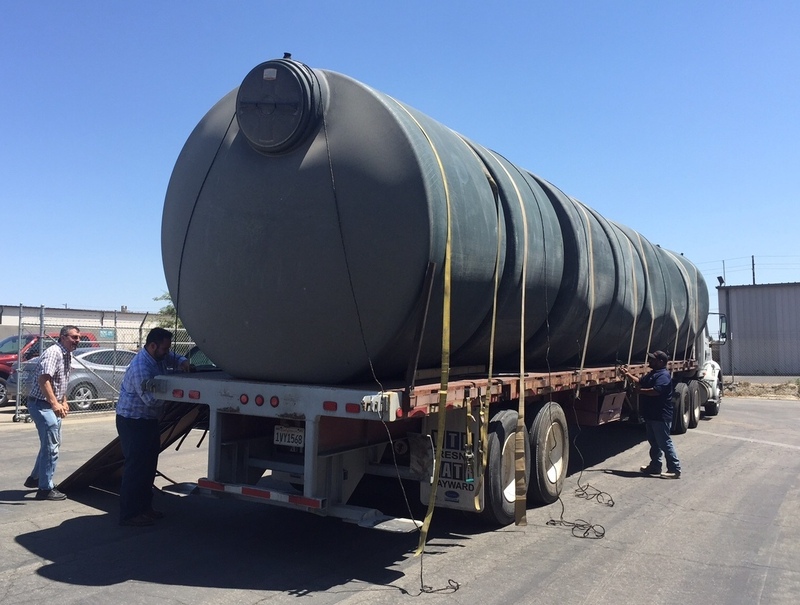 So far about 140 tanks have been distributed to homes, but at least 1,000 more are needed in Tulare County alone. That's because at least 1,300 residential wells have run dry, affecting at least 7,000 people. When your taps start spitting out air here, Paul Boyer and his team are who you call. Under a punishing midafternoon sun, Boyer helps muscle down five of these hefty 400-pound water tanks from a semi-truck flatbed. He helps run a local nonprofit that's in charge of distributing these 2,500-gallon water tanks to drought victims. These are the kinds of tanks you see attached to homes in many parts of the developing world. In Tulare County, it's an urgent matter, since only about 150 have been distributed so far. "That means, actually, there's more than 1,100 homes that don't have this," Boyer says. If you're without water, these tanks are definitely a lifeline. They can supply a typical family for about two weeks. "This should only be a temporary solution, because hauled water is very expensive," Boyer says. "But without this, it's difficult for people to stay in their homes, because you need that water for flushing your toilet, taking a bath, washing your dishes." That's why Boyer is trying to keep an eye on the long term. One plan is to try to get people in rural areas hooked onto municipal water systems, like what's happening outside the small town of Farmersville. Farmersville is a largely poor neighborhood just outside the Visalia city limits, home to mostly farmworkers. Some residents raise chickens and goats under improvised, backyard shelters. In Frank Zamora's dusty front yard, even the cactus looks wilted. Next to it, he has dug an open trench leading out to the street. Thanks to a $1 million grant, he and his neighbors are about to hook on to city water. That's good news for Zamora, who figures his taps will run completely dry any day now. "When I water, maybe let's say for 10, 15 minutes, then it'll start throwing air, already, so I gotta stop, wait for the well to go back up, and then I can use the water again," he says. The idea is that by hooking people like Zamora onto a municipal water system, the risk is spread out. And cities are in a better position to regulate and control what water is left. They also have more money and could possibly afford to drill new, deeper wells. At least that's the thinking. "I feel a little bit of security," Zamora says. "We're all hoping for some rain, so, if not, we're going to be in a big jam." And that's just it. Just because you're hooked up to a city system doesn't necessarily mean there will always be water. This drought is so bad that if it goes on much longer, the worry is that cities in the Central Valley will also start running out of water. Most cities here are already completely dependent on underground aquifers. And groundwater is getting depleted at a record pace. Porterville, an agricultural hub of the Central Valley, has been distributing water to about 7,000 people in a neighborhood just outside the city limits where most of the wells have run dry. The city has set up water distribution centers where people can fill up jugs and barrels for free and also take a shower. But Porterville Mayor Milt Stowe is trying to figure out how much longer his city can reasonably do this. "It's a big concern, because it's going to put our city in jeopardy," he says. "We weren't counting on using the water for the incorporated areas, but, you know, we can't let 'em go without water." Stowe says the city has enough water to supply its people through this summer. But even this fall? That's an open question. "It's very stressful," he says. "It has come to a point where, we're getting close to like figure out something else to do. You know, getting water from other places, or whatever the case may be, but it's getting to a point where we're gonna have to start begging." People here are worried. And some are considering packing up and leaving altogether. 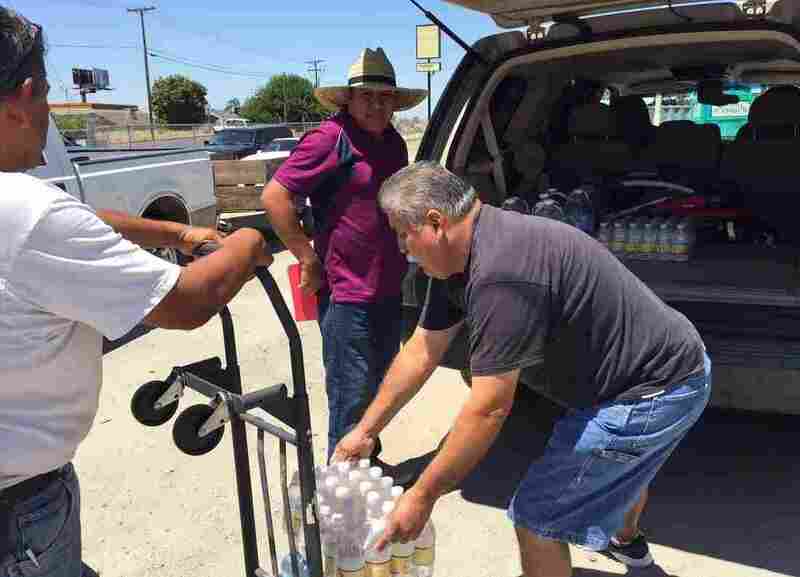 Pastor Frank Olmedo of the Spanish Church of the Nazarene in Porterville Calif., loads cases of bottled water into Humberto Hernandez's Suburban. These aid stations are a lifeline here, where residents like Hernandez have been living without water for more than six months. At one of Porterville's volunteer-run aid stations, Humberto Hernandez is loading up his Chevy Suburban with donated cases of bottled water. He's grateful for the help, since his taps ran dry six months ago. He and his wife have three kids at home, including a 6-month-old baby. Hernandez, who has lived in Porterville for 30 years, says it has been tough and the family can't live like this much longer. They'll wait another month. He says he has relatives in Colorado. The drought isn't as bad there and there are farm jobs.